I had not intended to share another castle with you today, in the midst of my castle trilogy of walks, but the owners of Brancepeth Castle touched me deeply. How can such a monumental castle remain so unknown? And how much more effort can a man and wife put into the preservation of their home? Had it not been for the Heritage Open Day events, I should never have known this story. Brancepeth is a tiny and delightful village, just 5 miles south-west of Durham City. A Norman castle was built here, on a fine lookout point across the valley. It was rebuilt by the Neville family in the late 14th century, then confiscated by the Crown, in 1569, for their involvement in the Rising of the North. A succession of owners followed, the last major restoration at the hands of the architect Anthony Salvin in the mid-19th century. The castle has never seen conflict, but in 1939 became the headquarters of the Durham Light Infantry. They left in 1962. And then the current poignant phase of the castle’s history began. In 1978, Margaret Dobson, wife of publisher Dennis Dobson, bought the castle to store the company’s stock of books, the lease on their Notting Hill property having expired. Her husband died before the move north, but she and her 7 children inhabited the castle. Mrs. Dobson did much to restore fabric and interiors but, you can imagine, such a property is a money pit. The lead roof had been stripped by a previous tenant. The resourceful lady refurbished the main function rooms to generate income from craft fairs and auctions. Shakespearean plays were staged in the courtyard, and rooms let to students at Durham University. Since her death, aged 86, in October 2014, family have carried on the work as best they can. Her daughter, who led the tour, explained that metal supports had been used in the most recent restoration. The rusting of these necessitated rebuilding, at the cost of £86,000 for just one of the vital towers. The building is astounding. Everything from the huge chapel to original medieval vaults below ground. The contrast between the beauty I’ve shown you, and the incredible amount of work still to be done couldn’t be greater. Ceilings and paintwork peel, draughty corridors and flights of stairs proliferate. But the building is loved, and nurtured, by a couple no longer young, but dedicated. I wish them well. Please go and attend one of their events, if you can. The cause must have its champions up and down the country, but none is more committed than Becky. As another Heritage Open Day weekend begins, join her In the Pink, and then get yourself out and find something interesting in your area. Excellent article which really captures the feel of the Castle and the Castle family, and all their hard work to preserve this building for the future. Powderham Castle near here has similar problems, and the young Earl and Countess of Devon are working hard to keep it going. Not a responsibility I’d want, it’s relentless. What a wonderful castle, and so glad you found it as part of Heritage Open Days. and thank you so much for your lovely lovely finish. Not sure I am the most committed as my fellow volunteer Nicky truly is extraordinary, but I certainly have given up a few weeks of my life to this!! Hiya darlin 🙂 🙂 A little frantic right now, as we may have sold our house and I seem to be cramming in ever more outings before we go to the Algarve. 🙂 All good with you? That does sound delightful to gather memories to cart with you all the way to the beauteous Algarve. So finally it has come, the time. Trite — but time gallops! Fascinating history of this behemoth from the past, Jo, thanks so much for taking us through. 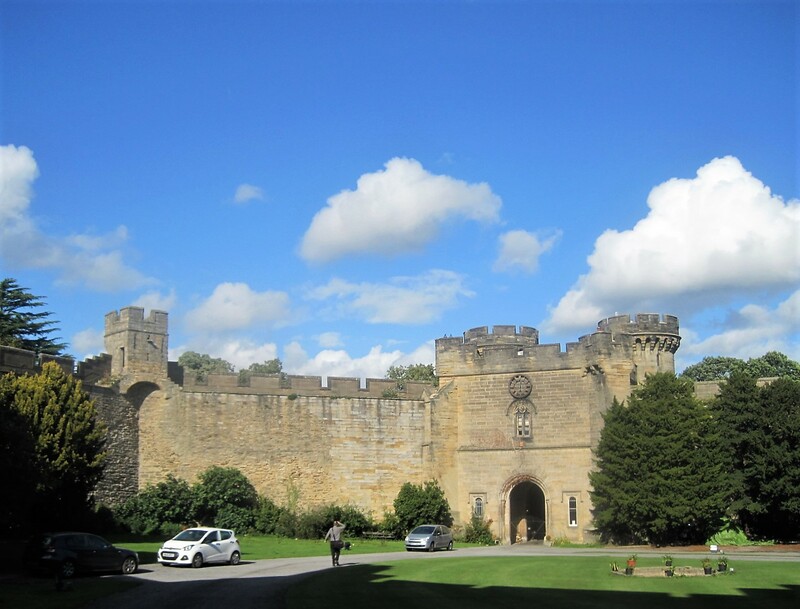 Your photos give us a good idea of the Brancepeth Castle, and I also enjoyed your narrative. The creativity and tenacity of the Dobson family is unique. It is! Moving back in the next two weeks. yay! Thanks for your kindness, Jo. It is quite an expense for the family to restore it but what a great thing to do. They are keeping a piece of history alive. I would certainly visit it. I admire the family for keeping it up but my eyeball twitches at the thought of the effort and the expense. It looks like it was a brilliant day for this castle walk Jo. Enjoy the weekend! Aw, c’mon, Sue! I bet you and Dave are dab hands with a paint brush 🙂 🙂 I can lend a couple of boiler suits. Thanks, darlin! Life feels a little crazy at the moment but I’m sure it will get better. I can’t imagine the effort. I moan and groan about the upkeep of a modern house, but taking care of a castle and raising a family there seems almost impossible. Thank goodness for those who do want to preserve these treasures! Our daughter chose this venue for her wedding October 2017. So worth the organising of hiring tables/chairs and outside caterers. Such a beautiful setting for a wedding.